In 1871 General George Crook enrolled 50 White Mountain Apache men to serve as scouts for his army during the Apache Wars, which lasted for 15 years. These wars were ended with the surrender of the Chiricahua leader Geronimo in 1886. 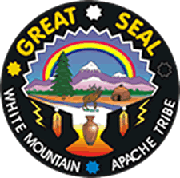 Because of the scouts' service to General Cook during the Apache Wars, their tribe was able to maintain a large portion of their homeland as the White Mountain Apache reservation. In 1922, the U.S. Army left Fort Apache. In 1923, the Bureau of Indian Affairs' Theodore Roosevelt Indian Boarding School was established to use these facilities. The school was designated a National Historic Landmark in 2012, as a component of Fort Apache Historic Park, which recognizes the former military complex. The Roosevelt Indian School now operates as a tribally controlled middle-school facility. The White Mountain Apache created their own constitution under the Indian Reorganization Act of 1934. In 1936 they elected a tribal council that oversaw all tribe-owned property, local businesses, and governance in 1936. The Fort Apache Indian Reservation is covered mostly by pine forests and is habitat to a variety of forest wildlife. 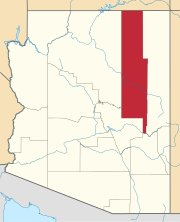 It is located directly south of the Mogollon Rim. The highest point in the reservation is Baldy Peak, with an elevation of 11,403 feet (3,476 m). The tribe operates the Sunrise ski resort and the Hon-Dah Resort Casino. It has built the Apache Cultural Center & Museum, constructed in the traditional style of a gowa. Other attractions within the reservation include the Fort Apache Historic Park, which has 27 buildings surviving of the historic fort and a 288-acre (117 ha) National Historic District; and other historic sites. Kinishba Ruins, an ancient archeological site (AD 1150–1350) of the western Pueblo culture, is a National Historic Landmark. It is located on nearby associated tribal trust lands. Appointments may be made to visit the site. 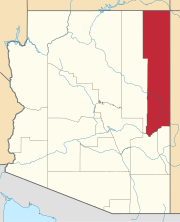 According to the US Census Bureau, the Fort Apache Indian Reservation, which is located in Navajo County, is developed with small communities. North Fork, Whiteriver, Fort Apache, East Fork, Rainbow City, Cibecue, Hon-Dah, McNary, Turkey Creek, and Seven Mile are the communities, comprising a total population of 22,036 in 2010 on the reservation. Goddard, Pliny Earle (1920). White Mountain Apache texts. The Trustees. Retrieved 24 August 2012. Goodwin, Grenville. Myths and Tales of the White Mountain Apache. University of Arizona Press (March 1, 1994). Wikimedia Commons has media related to Fort Apache Indian Reservation.